The Winery: The Diem family has been making wine since 1848 in the town of Obermarkersdorf in the northeastern part of the Weinviertel. 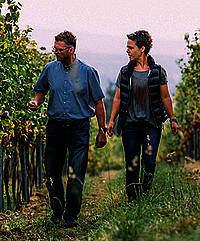 Fifth generation winemaker Gerald Diem took over the estate in 2000. Winemaking has been his passion for as long as he can remember and he meticulously balances traditional methods and modern technology. Originally from the wine town of Retz, his wife Andrea is also a passionate vintner and manages distribution of the wines and marketing of the winery. Vinification: Skin contact, several months on the fine yeast (Sur Lie) in steel tank, neutral yeast, partial or spontaneous fermentation, reserve wines in large used wood. Diem attaches particular importance to viticulture close to nature, the sustainable management of our soils and the longevity of our vines. They refrain from using herbicides, pesticides and chemical fertilizers and are certified organic (Austria).